I love public speaking. The preparation, topic selection, putting together a structure and coming up with a seamless flow of thoughts/ideas, delivering the presentation in front of an audience, taking questions - the entire process excites me. Though I have participated in a couple of speech and debate contests at school, I wasn't naturally good at it from my childhood. I wanted to become a good speaker and have been investing time and effort over many years. Thanks to my first job at Oracle where there was an active Toastmasters club, I started to work and refine my public speaking skills. Whenever there's any presentation to be given at work either to an internal audience or to customers, I look forward to it. I also love to speak at lectures/sessions at public events and I have managed to speak at 4 such sessions so far (would love to do more!). Although I have good experience in public speaking, I still believe there are certain areas that I need to improve upon. I listen to prominent TED speakers and observe their style and presentation during my free time. This interest towards public speaking led me to stumble upon Poornima Vijayashankar's works. I have listened to some of her talks in her Femgineer youtube channel. She is very natural in her flow of words, very confident and has a good style of coherently presenting a concept/idea. 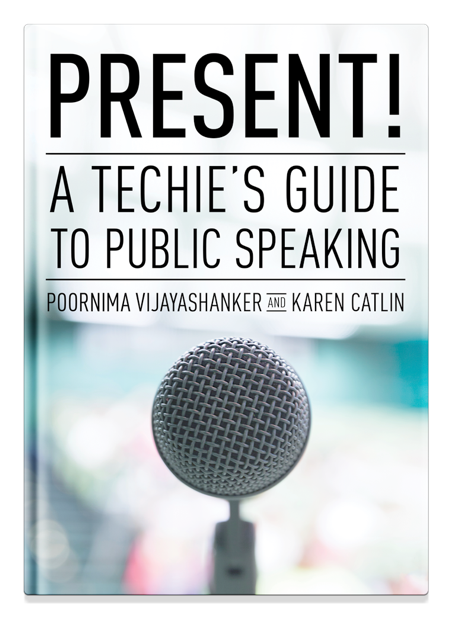 When she announced that she is looking for peer reviewers for her new book "Present: A techie's guide to public speaking" which she has co-authored with Karen Catlin, I jumped at the opportunity immediately. Expressing and articulating your ideas clearly and to-the-point is a valuable skill in today's knowledge economy. Unfortunately, this skill doesn't get enough attention in our schools and colleges. When young talented grads enter the workforce, they find it really challenging as they lack the confidence to speak up. After reading the book, my instant reaction was "Wish I read this book 13 years ago". The ideas and principles that Poornima and Karen have put together are very easy to understand, with interesting personal anecdotes and experiences that we can easily relate to. 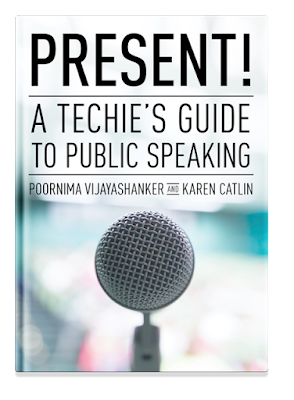 Right from tackling stage fright, picking the right topic, developing the outline and preparing an engaging talk, Poornima and Karen have covered it all. The exercises give enough direction and guidance to practice the principles that make you feel more confident. 1. "You don't have to be an expert" - Keep the topic within the scope of your knowledge and experience. Set the expectations clear. 2. "Evoke an emotional response from the audience". Share personal stories, interesting and frustrating moments, humor, suspense etc. This is applicable even if the topic is a serious one. 3. Build up an audience focused proposal. Identify their persona and their motivations. List down the take-aways that would be relevant for them. 4. Leverage the power of stories. Stories make abstract ideas concrete, they are relatable and captivating. 5. Develop an outline and practice your talk before you start preparing your slides. This came as a surprise to me. I usually prepare with ideas and thoughts jotted down in an Evernote note, translate them to a rough outline in Powerpoint, nail down the flow while working on the slides and then practice a few times using the slides. The authors however present a different view though, which I now believe makes more sense. Slides should only help accent your presentation and shouldn't become a crutch. I loved reading this book and I highly recommend this book to anyone who is interested in public speaking - whether you are a new or a seasoned speaker, I'm sure you'll find a lot of take-aways.